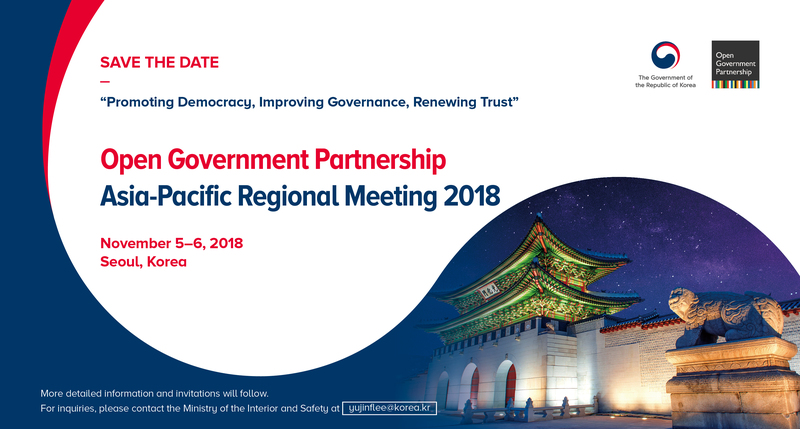 The Government of the Republic of Korea hosted the Open Government Partnership (OGP) Asia-Pacific Regional Meeting 2018 in Seoul, Korea, on November 5-6, 2018. In its role as a member of the OGP Steering Committee, the Republic of Korea convened open government leaders and practitioners from across the region to raise collective ambition and generate new political support to make governments more transparent, accountable, and responsive to citizens. The OGP Asia-Pacific Regional Meeting has been a great opportunity for OGP members and non-members to share lived experiences and explore a path towards open government under the themes of promoting participatory democracy, improving governance for a better life for all, and renewing public trust through government innovation. The meeting also marked the launch of Korea's Government Innovation Week, a collaborative initiative between government, civil society and international partners to promote dialogue between all stakeholders to find innovative ways to solve social problems. We invite our peers in the region to join this effort!